The pattern, designed by Lisa Richardson for Rowan 54, appeals to me on every level. Second, I love the shape. 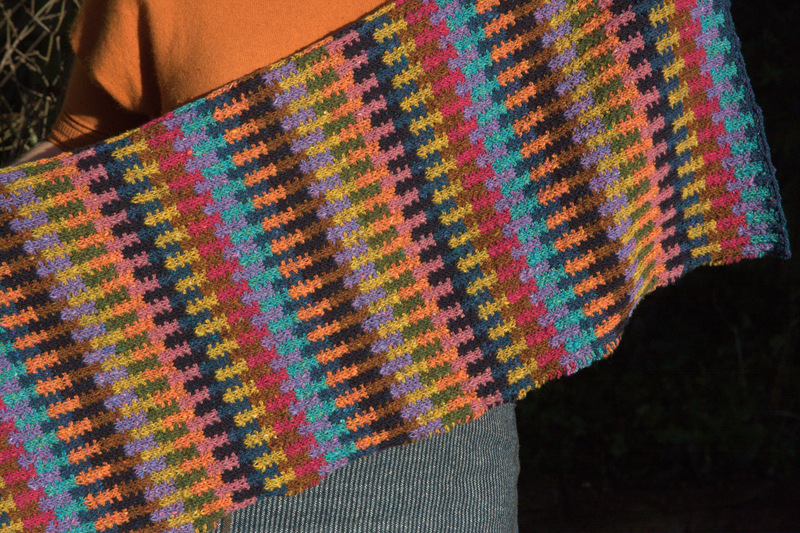 I am not inspired by the countless thousands of triangular or crescent shawl patterns being cranked out lately. (Don’t get me wrong – many of these are drop-dead gorgeous. It’s just that I know I won’t be wearing them. I’ve even knit some beautiful ones and they don’t get worn.) Give me a giant, rectangular wrap, however, and I am all over it. My Cabled Rib shawl, which is a big, rectangular wrap, is a wardrobe staple and gets worn all the time. I also love the yarn. This is knit with Rowan Fine Tweed, which I adore. 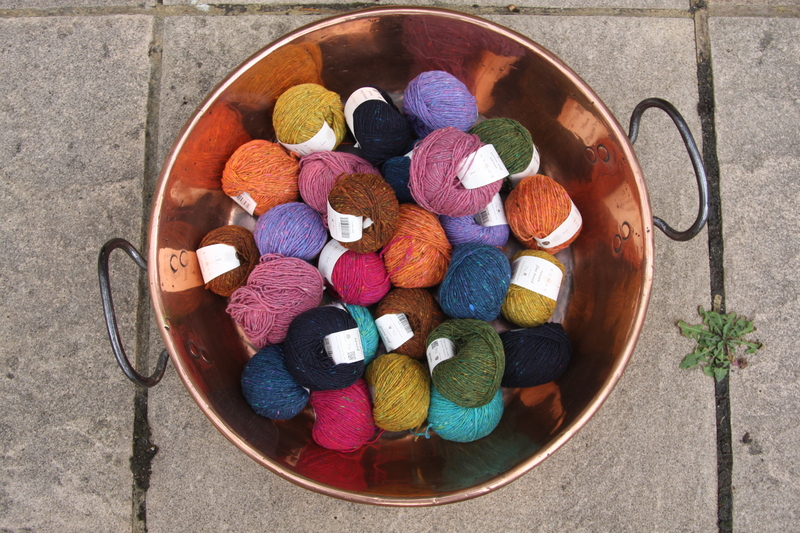 It is so perfectly tweedy, so rich and vibrant, comes in so many fabulous shades, and makes the best colourwork. 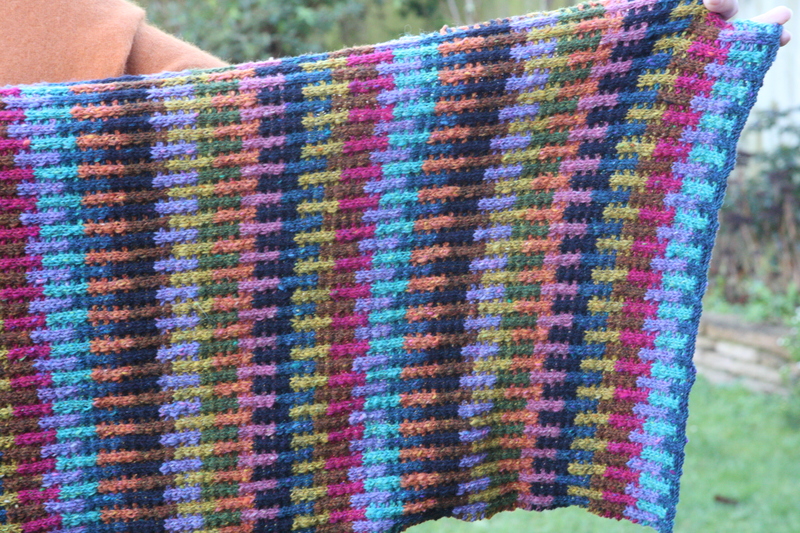 This yarn just makes me happy. 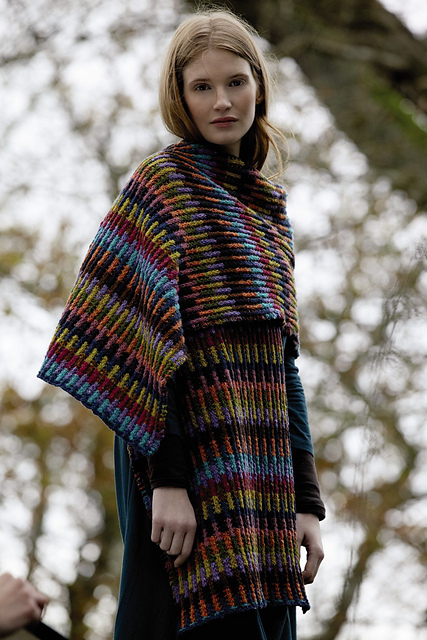 Ok, so we have established beyond a doubt that I love the Soumak Wrap. So, why in the heck is this project still on my needles more than A YEAR after casting on????? Why can’t I finish this baby? What can possibly be the trouble with Soumak? Soumak, you see, is my TV knitting. It is the project I pick up when I watch TV. And therein lies the problem. I hate TV. I rarely, if ever, watch it. Here is a true story. A few weeks ago when Doug was in India, I read a newspaper article about someone re-making the movie Ghostbusters with an all-female cast. I got a wild idea to watch “Ghostbusters.” (I was a student at Columbia University when they filmed Ghostbusters there. The movie is now thirty years old. Yikes!) I cooked myself a nice dinner, poured a glass of wine, sat down with my Soumak to knit and watch the DVD, and realized that I didn’t know how to turn it on. Doug telephoned around this time, and I had to ask him for instructions. (In my defense, the DVD is run through the PS3 and through the stereo and needs more than one set of remotes to activate.) Doug gave me careful instructions and then had to run; try as I might I couldn’t get the damn thing to work and had to text Emma, in Vancouver, for supplemental help! It took three people on three continents to turn on the movie! 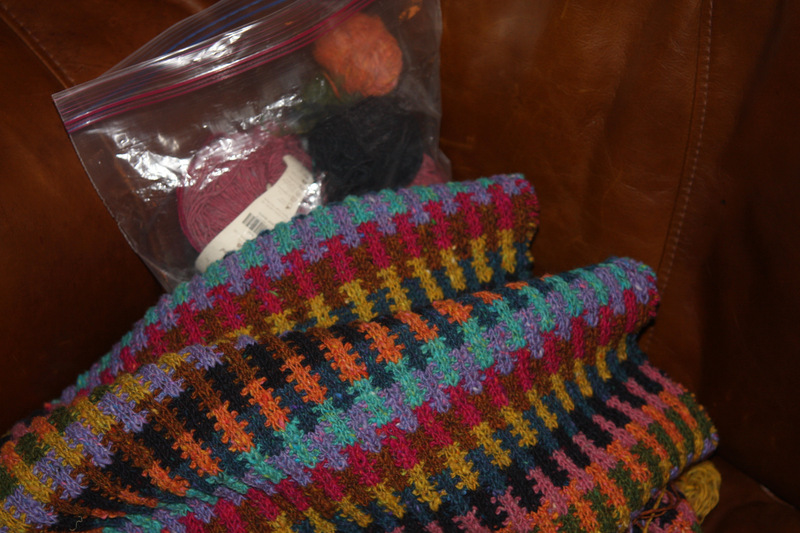 When the girls were still around, I would often sit with them and knit while they watched something. Now that they are gone, the concept of TV knitting seems to be generally problematic. If I have a choice between reading and watching TV, reading ALWAYS wins. So where does this leave my Soumak? Not finished, that’s where! I have two options here. First, I could learn to like TV for the sake of my knitting. Second, I could re-christen Soumak: instead of my TV knitting project, I can make it my Morning-coffee knitting project, or my audiobook knitting project, or maybe even my Zen-quiet-peaceful knitting project. I think the trouble with Soumak is definitional. This entry was posted in Main and tagged Knitting, Lisa Richardson, Rowan 54, Rowan Fine Tweed, Soumak Scarf Wrap by knitigatingcircumstances. Bookmark the permalink. I get so much of my knitting done while watching TV. It makes me feel like I get so much more accomplished. 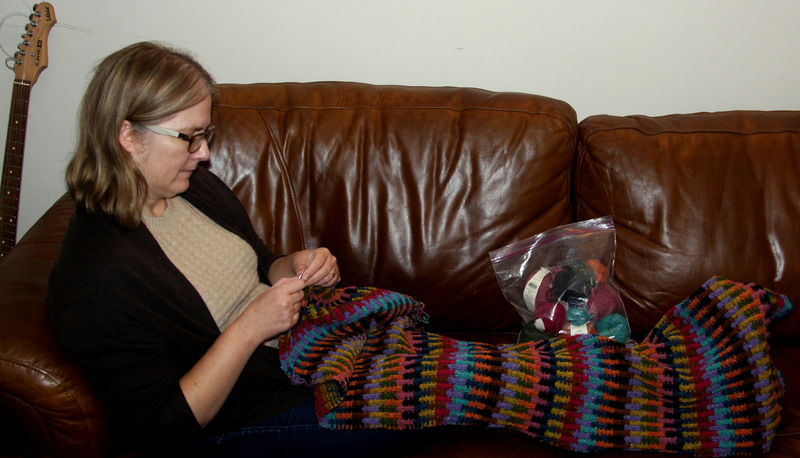 Knitting in front of TV makes the idleness of TV watching much less sinful… or at least much more productive. I’m all for it! We cut our cable line last year, even though I’m a big TV watcher, and my knitting’s declined substantially. Maybe find a serial program that interests you. I finished up a long-time UFO watching Orange is the New Black. The answer is clear. You need a wood stove or a fire place! I am so happy to see you show your Soumak some love. You will adore it when it’s done! Keep chugging away at it! I also don’t watch TV, but i do know how to turn it on!! you made me laugh with this post!!! good luck with the re-definition, I would like to see the final result!! I use a wii to operate Netflix. It like a military campaign to get the tv on. My daughter looks at me pityingly if she is going out and leaving me in the house by myself and offers to put it on for me. I am always ridiculously grateful! Lol! Love, love, love your Soumak. I TV knit. We don’t have cable but I use Netflix and Hulu. Both have lots of movies and shows so I’m never bored. I’m a recent convert to Audible.co.uk after being directed there while searching for a Radio 4 play. My knitting isn’t good enough to be able to watch TV at the same time so it suits me very well. Well done with your Soumak. So after seeing your soumak posts and seeing this yarn in the yarns store I’ve been thinking about doing this pattern for a while. But today I arrived at my favorite yarn store and there it is, a completed soumak made by the yarn shop lady!. After touching it and putting it on during the whole time I was there I made my decision, I’m going to make it. Not so big though, I’ll do a scarf instead. c) as if they just survived a serious illness. d) they do not like the clothes they’ve been put in. Why is it that Rowan can’t show happy pictures? Your finished soumak wrap looks so much better in your photos, it would motivate me much more to make it than Rowan’s photo. That said, I really love your FOs and the photos!